Awesome new trail run through Loveday 4x4 Adventure Park. Challenging runs through the Off-Road race track. Range of surfaces from hard packed tracks to deep soft sand and stoney section. 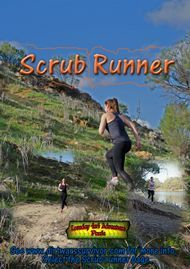 Scrub Runner is run across a range of outback terrain. We utilize the Loveday 350 Offroad race track jumps and all for the 35k run.